Washington — As House Republicans once again voted to repeal the Affordable Care Act this week, there was further evidence the controversial bill is contributing to the good health of some of the nation’s major health insurers. Tuesday, the same day the House voted for repeal, Aetna reported adding more than 1 million new health insurance clients since last year, about half coming from the state health exchanges created by the health-care law. The Hartford-based insurer’s 2014 earnings report said enrollment climbed 6 percent to 23.5 million people compared with 2013. 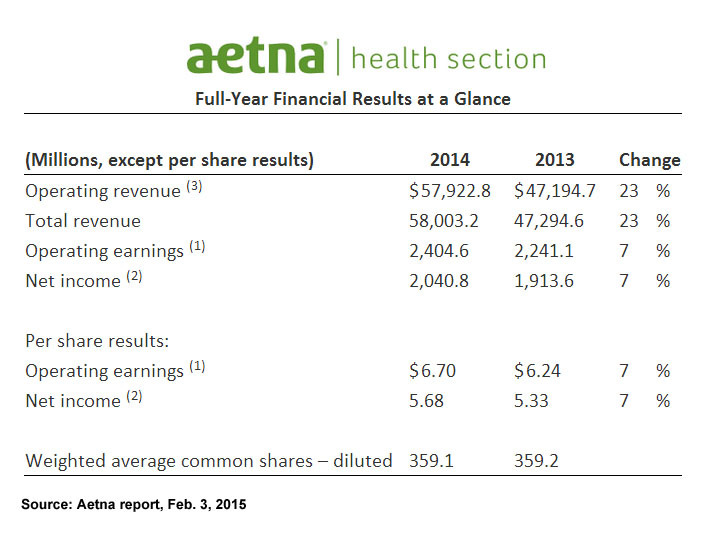 That’s about 1.1 million more people enrolled in Aetna plans. 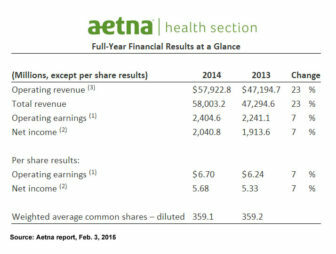 Some 560,000 came through the state exchanges Aetna participates in. Bertolini said picking the right states to sell its policies helped the bottom line. “These strong results validate our strategy of focusing on geographies where we have a competitive cost structure and can provide the greatest value to potential customers,” he said. Aetna sells policies in 17 state exchanges, but does not participate in Connecticut’s exchange, called Access Health CT.
Aetna is not the only insurer to appear to benefit from the ACA. Aetna shares rose nearly 30 percent last year, hitting several all-time highs, but so did the stocks of rivals UnitedHealth Group Inc. and Anthem Inc. Testing the waters of the new health care system, UnitedHealth Group participated in only four exchanges last year. This year, that number increased to 23, accounting for 54 percent of the U.S. health care market. The company also added individual policies to its offerings at Access Health CT. In its Jan. 21 earnings briefing, the UnitedHealth Group beat expectations. Even with limited participation in exchanges last year, the company’s increased policyholders outside the exchange because of the ACA’s mandate to purchase insurance and saw its share of the Medicaid market rise. And the insurer said it is exceeding expectations for 2015 enrollment through exchanges. Anthem BlueCross/Blue Shield was also optimistic when it reported it’s fourth-quarter results last week. “We are pleased with the solid finish to 2014, which leaves us well-positioned for growth in 2015. Our membership growth in 2014 is encouraging …,” said Anthem President Joseph Swedish. Analysts point to several reasons for the boost in stock prices and revenues. Deborah Chollet, senior fellow with Mathematica Policy Research, a public policy research company, said the fortunes of health insurers began to improve in 2013, the year before major portions of the ACA were implemented, because the rise in health care costs slowed dramatically. Chollet said the jury is still out on whether the ACA contributed to the slowdown in costs, with economists split on Obamacare’s impact. But she believes the ACA forced insurers to become more competitive. “It caused the players in the market to push back against cost increases,” she said. The economic recovery also helped, Chollet said, resulting in the growth of group plans as well. She also said dire predictions by insurers that new ACA fees and restrictions on their medical loss ratios – the difference between premiums charged and claims paid – would hurt health insurers were exaggerated. “They can do quite well within the ACA constraints,” she said. Kevin Counihan, the former CEO of Access Health who was tapped by President Obama to run the federal exchanges used by many states, said the numbers of competitors in the exchanges grew by 25 percent from the 2014 enrollment period to the 2015 enrollment period, evidence that the ACA is good for insurers. “It’s certainly feeling like they are saying, ‘This is a good business to be in,” Counihan said. Aetna, UnitedHealthcare and other insurers also benefited from the expansion of Medicaid, the government health program for the poor, in many states. That’s because those states are shifting their Medicaid programs to managed care insurers that are generally paid fixed fees per enrollee. UnitedHealthcare, for example, said it increased its Medicaid enrollment by one million people last year. Yet Vishnu Lekraj, an insurance analyst for Morningstar, cautioned, however, that if any insurer makes a misstep in the post-ACA environment, it could experience losses. That’s because insurers, on average, are making less profit on individual policies, with a margin of only about 1 or 2 percent. “The ACA definitely provided a growth opportunity for insurers, but along with the growth comes a lower level of profitability,'” Lekraj said. Still, Lekraj said some of the concerns insurers had about the ACA were unfounded. “They navigated the exchanges better than investors thought they would,” he said. The infusion of billions of federal dollars in federal subsidies into the marketplace to make health care policies affordable for many Americans helped. But those subsidies are now being attacked in court. Although it has sometimes seemed like the industry’s support of the ACA has been lukewarm, it is fighting attempts In the U.S. Supreme Court to sabotage the health care law. Most recently America’s Health Insurance Plans, the trade organization for the nation’s major health insurers, filed a friend-of-the-court brief bolstering the Obama administration’s defense of the ACA against a legal challenge to the tax credits given to some individuals and families to help them buy policies in the exchanges. The petitioners argue that specific language used in the ACA should be interpreted to mean that individuals who live in the 34 states that use the federal exchange should not receive federal subsidies. AHIP says pulling subsidies from those states would destabilize the system because many of those receiving subsidies are young people and young families who tend to be healthier than the population at large but would be likely to become uninsured without financial help. The bill approved by the House this week contained language that requires the GOP to come up with an alternative plan. That plan was revealed on Wednesday. It would eliminate the requirement that nearly all Americans purchase health insurance and eliminate the expansion of Medicaid. The plan would, however, offer subsidies to purchase insurance in the form of refundable tax credits to individuals and families that earn up to 300 percent of poverty-level income. And like the ACA, dependents would be able to stay on their parents’ healthcare plans until they’re 26, and no one could be denied coverage for pre-existing conditions — although the proposal requires individuals have ‘continuous coverage’ to benefit from that protection.